As Harvey’s waters strand thousands of folks in their homes and send some onto rooftops — a chorus of onlookers have asked: Why didn’t more local officials order mandatory evacuations? Walking the soggy streets of her League City neighborhood, Diane Alston said she was “heartbroken” that so many people waited out Harvey’s steady rains from inside their flooding homes, following instructions from local officials. Alston, 23, looked like one of the lucky ones in this community about 25 miles southeast of Houston, even if she spent most of Friday night moving furniture in her two-story home to reduce the chances any of it gets ruined by floodwater. On Sunday, her family still had electricity and their street wasn’t completely under water. At least five people have already been reported dead as Harvey, previously a hurricane and now a slow-moving tropical storm, continues to feed rising waters across the nation’s fourth largest city and its surrounding communities. As the waters strand thousands of folks in their homes and send some onto rooftops — a chorus of onlookers have asked: Why didn’t local officials order mandatory evacuations, as more than a dozen other smaller Texas cities and counties did? Such a decision is thorny in any community, and only grows more so in such a sprawling metropolitan area. On Friday, with the hurricane-turned tropical storm approaching the Gulf Coast, Gov. Greg Abbott told folks in Corpus Christi and Houston, the two largest cities in the storm’s path, to “strongly consider evacuating” northward. While Corpus Christi issued a voluntary evacuation, neither Houston nor Harris County issued any such evacuation order at all. Ultimately, mayors and county judges are charged with making such decisions. 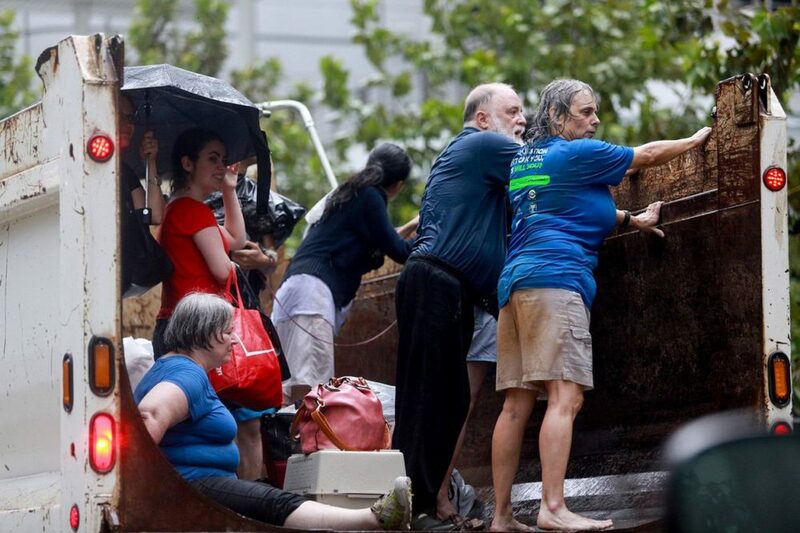 Leaders in Houston and Harris County told residents to stay put ahead of the storm and have since defended those decisions — even as bayous spill into the streets in what might be the worst flood event the area has ever seen. “To suggest that we should have evacuated 2 million people is an outrageous statement,” Harris County Judge Emmett told CNN on Sunday. Emmett and others have offered a litany of reasons for hunkering down. That includes the reality that such a mass evacuation can turn into logistical nightmare with huge safety risks of its own. Shepherd pointed to data from the National Oceanic and Atmospheric Administration showing that drivers accounted for 66 percent of U.S. flood fatalities in 2014. For a vivid example of what can go wrong in a large-scale evacuation, Texans can look twelve years back to Hurricane Rita, when more than 3 million people from south and southeast Texas set off on one of the largest evacuations in U.S. history. The backdrop of that blistering summer in 2005: Just three weeks earlier, Hurricane Katrina had submerged New Orleans and killed 1,200 people when Rita barreled toward the coastline. Texans didn’t want to stick around to see how Rita would compare, so they bolted — or tried to. Traffic jams stretched across hundreds of miles over two days, and many people ran out of gas. Dozens died from accidents and heat-related illnesses, all before Rita even made landfall. Of the 139 deaths that the state linked to Hurricane Rita, 73 occurred before the storm hit Texas. Twenty-three people died in a bus fire. Ten others died from hyperthermia due to heat exposure. 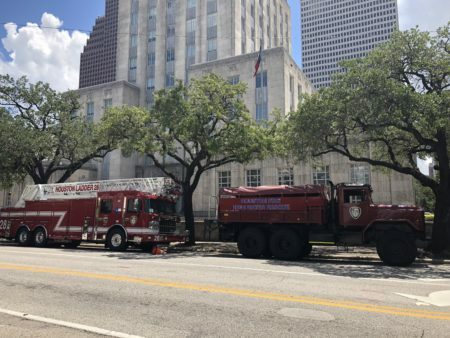 In the years since Rita, state and local officials say new laws and better planning would help the state’s next evacuation go more smoothly, but Houston mayor Sylvester Turner this weekend indicated Rita’s legacy factored into his decision. Emmett, the Harris County Judge, has pointed to additional factors in defense of calls to stay, drawing distinctions between danger from Harvey — primarily rainfall — and the hurricanes that struck before it. While ordering a hurricane evacuation is common, telling residents to flee a rainstorm is rare, if not unprecedented. “We’ve had three major rain events in the past two years. This is now the fourth,” Emmett said. Emmett, in the CNN interview, bristled at those who were pushing conflicting messages. That included retired Lt. General Russel Honoré, who commanded a joint task force that responded to Hurricane Katrina. Abbott, for his part, said he’s not spending his time second-guessing local officials. Harris County wasn’t the only Harvey-hit community where residents were told to stay in place. Corpus Christi and Nueces County refrained from calling for mandatory evacuations before the storm took aim Friday. 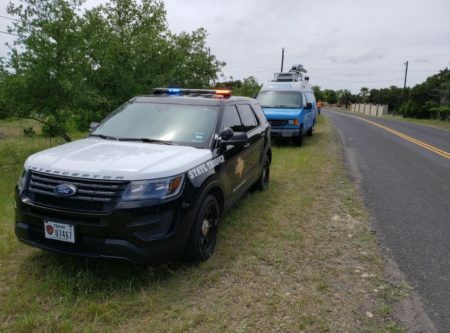 Corpus Christi was largely spared from massive property damage and life-threatening destruction when the storm hit farther east along the coast, killing at least one person in Aransas County, where an evacuation order was mandatory.